Hanlon, an elderly woman who split her time between her apartment in New York and her deceased mother’s home in New Jersey was wary—she had never seen this man before. She opened the door. Standing tall in her doorway, the “contractor” soon started asking questions: Did Hanlon spend most of her time here in New Jersey or in New York? Was she interested in moving out of the New York apartment? Would she accept money to leave it? How much? Hanlon threatened to call the police if he didn’t leave. He didn’t. In court documents filed with the New York County Clerk’s office, Hanlon would later tell prosecutors, that he pulled out his phone and circled the premises, taking pictures of her mother’s New Jersey house. “Proof of residence,” he would later claim. Police would eventually arrive and charge the man, Anthony Falconite, with criminal stalking. As Hanlon would learn long after the encounter, Falconite was never a building contractor. He was a private investigator sent by her landlord, Steve Croman, to pressure her into leaving her New York apartment. Dozens more New York tenants would later claim Falconite, posing as a UPS employee or a contractor to gain access to their buildings, was part of the scheme to pressure them into moving out of their apartments. What sent Falconite to Hanlon’s door was a legal loophole that’s caused enormous consequences for renters throughout the city. Under New York law, lifelong New York residents are eligible for rent stabilized apartments, significantly cheaper than typical rent and with limited annual increases. The loophole: if the tenant in a rent-stabilized apartment leaves, the landlord can usually charge the next tenant full market price. Obviously, this incentivizes pushing out rent stabilized tenants. Rent stabilization is only offered to tenants who have lived in buildings continuously since 1971. Further, they must have lived there continuously, which is why Falconite wanted the pictures of Hanlon at her mother’s home in New Jersey, as evidence the New York apartment was no longer her primary residence. Over the years, elderly New York residents have reported many harassment tactics: sending false “contractors” to apply pressure, ignoring maintenance requests, or turning off heat or hot water. Falconite would later admit he was paid $1,000 for each tenant that left. His employer, Croman was marched off to Rikers for tax fraud, and New York erected the Tenant Harassment Prevention Task Force, a multi-office collaboration meant to help tenants if they’re under attack by a landlord. Enter: the Mayor’s Office on Data Analytics, who used an algorithm to try and “predict” housing discrimination. In collaborative projects with the Council on Human Rights and Tenant Harassment Prevention Task Force, MODA created algorithms to detect two forms of housing discrimination targeted at low income renters. Tenant harassment, which pushes out people with rent stabilized apartments, and housing voucher discrimination. Housing vouchers are rental subsidies; renters themselves pay up to a certain percentage of their income, while the rest is paid for by the city. Landlords, Croman included, have been known to rescind housing offers when they realize the applicant is using vouchers. 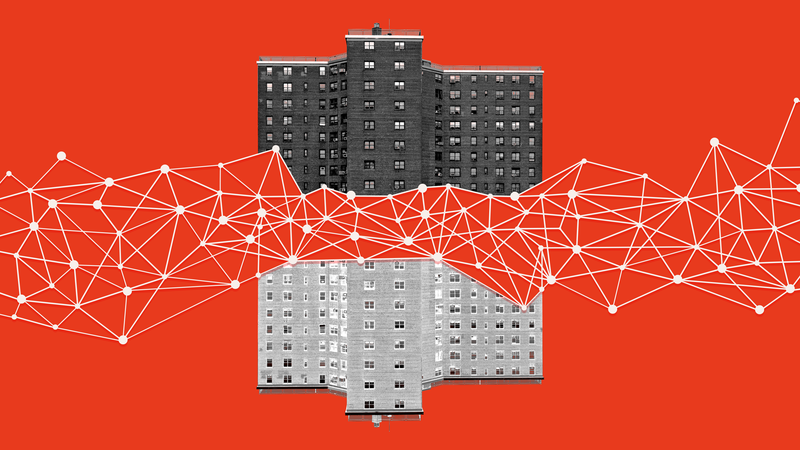 So, MODA created algorithms that pinpoint the predictors of income discrimination, one set attuned to finding tenant harassment and another for voucher discrimination. To identify the places housing voucher discrimination might be happening, MODA created a ranking and sorting algorithm. They compared census data to voucher use data, to see where drastically fewer people use vouchers than qualify. MODA followed a very simple logic: if possible, people will gravitate towards neighborhoods where schools are good, housing is affordable, and crime is low. MODA looks at areas that would otherwise seem ideal for all tenants (using public data on felony crime statistics, housing voucher use, and school achievement) but had very low voucher use—below the allotted amount. Of New York’s 195 neighborhoods, the MODA team isolated 24 neighborhoods with low crime, high student achievement, but curiously low housing voucher use. Using tax data, the MODA team grouped together residences owned by the same landlords, noting if one landlord owns multiple buildings with oddly low voucher usage. These neighborhoods are flagged as priorities and inspectors are encouraged to visit them first. When they arrive, inspectors interview tenants: Are their needs being met? Has their landlord responded promptly to maintenance requests? Have they threatened rent hikes or pressured them to take buyouts? Algorithms may point out disparities, but it takes humans to actually determine if discrimination is the cause. Inspectors build the cases that could eventually lead to criminal charges against discriminatory landlords. Voucher discrimination and tenant harassment are both serious problems, but also represent opposite trends. With voucher discrimination, analysts are looking for reasons why the flow of people into buildings is slowing. With tenant harassment, analysts want to find why the flow of people out of buildings is accelerating. There are thousands of rent-regulated units in New York City, meaning investigators need a way to prioritize which buildings to check. Further, just because tenants in rent-controlled buildings are leaving, it doesn’t necessarily mean they’re being harassed out. They could’ve legitimately chosen to leave. So, MODA spoke with health and housing experts, asking them about their investigations when finding harassment. What kept popping up? As it turns out: dust. MODA found that rent-stabilized buildings with 311 complaints of dust and asbestos were much more likely to shed low income tenants than those without. They tested other predictors, all based on anecdotes from experts, like illegal work complaints and intense construction. MODA quantified these anecdotes and created a ranking algorithm to spot where harassment might be happening. The algorithm scores the buildings with high rent-stabilized unit losses, ranking them based on the re-occurrence of these complaints. It isn’t literally “predicting” harassment, but ranking buildings according to the presence of variables which correlate with harassment. But, even with the best data, computation systems meant to “predict” risk or likelihood are very tricky. First: what happens if the model is wrong, either falsely flagging units for inspection or ignoring buildings where violations are happening? “We were comfortable doing this because we’re like ‘Okay, what happens if we’re wrong?’ They get a building inspector or a team of building inspectors coming to their building and turns out everything’s fine,” Patel said. But, both Patel and Zirngibl admit that this is a lot of computational power to solve what’s actually a legislative problem: closing the loophole would have the biggest impact on the loss of rent stabilized units, not just sending inspectors to specific neighborhoods. And while the model is promising, it’s missing a critical component: feedback. Inspectors may discover any number of violations when they arrive, leading up to notations or even arrests, but the MODA team says this feedback isn’t incorporated into the model. Many of New York’s housing and health inspectors still use a paper based system. Moreover, asking inspectors to fill out online forms would quantify the responses, but also add labor to an already overtaxed workforce. The infrastructural support to perfect the model may not be in place, but MODA hopes that this and similar projects can engender a change in the way public data scraping is used to help people. Still, since collaborating with MODA, both the Council on Human Rights and Tenant Harassment Prevention Task Force have made huge strides in fining violators. Last year, the Council filed income discrimination complaints against five of the largest landlords throughout the city, who together control over 20,000 units.